Dr. Leonard Schwartz created a video to demonstrate the performance of “isotonometrics”. Oddly enough the video title did not include the name! If that is no longer available, the reader can read the patent filing related to “hand clasps” or “isotonometrics” and envision how they might be used along with Dr. Schwartz’ “in place” exercise moves shown here with weights at DailyMotion. A fitness method for an exerciser combines the benefits of isometric-like exercising with isotonic exercising for simultaneous training of the exerciser’s cardiovascular and skeletal musculature systems and strength and endurance buildup. The method entails coupling the exerciser’s hands together in any one of a number of configurations and generating an isometric-like force during the coupling stage. The coupled hands can then be moved in any number of directions or coupled differently while maintaining or varying the isometric-like force during the movement. In addition, further training can be achieved by moving one or more other body parts during the coupled hand movement. The legs, torso, shoulders, and/or neck can be moved in any number of directions or sequences to exercise different muscle groups in conjunction with the muscle groups being worked by the movement of the coupled hands. 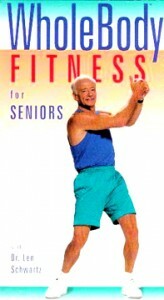 Though the video is intended for “seniors”, any fitness enthusiast may use the method. It was designed for anyone wishing to exercise without hand weights for whatever reason. Using this method, it is easily possible for even well conditioned athletes to do enough work to obtain a whole body aerobic effect as long as all four limbs are engaged in some fashion in a steady movement. Adding speed, pressure to the hand clasp, adding self-imposed tension in other areas of the body apart from the handclasp, or some combination of all these will ensure that the person exercising with this method is able to raise their heart rate into the “aerobic training range”. Like all of Schwartz’ exercise protocols, the cardinal rule is to engage as much muscle tissue from as many body sectors as possible throughout the movement. This minimizes the stress on any one muscle group, reduces overall soreness after exercise, and processes the most oxygen in the quickest amount of time to mimic the cross country skiers who were his original inspiration. So was this “isometrics”? Or “dynamic tension”? Or something else? That will be explored in a future article!